Long before Santa Claus flew through the sky in his shiny sleigh and eight wondrous reindeer it was a woman who flew on her broom, entering houses through chimneys to leave special goodies in the children's stockings. A chimney was her only access, as all the houses were long houses of thick walls; no windows; no doors. Entry was made by climbing a ladder and entering the home through the roof. Then, to keep the inhabitants safe, the ladder was drawn up. 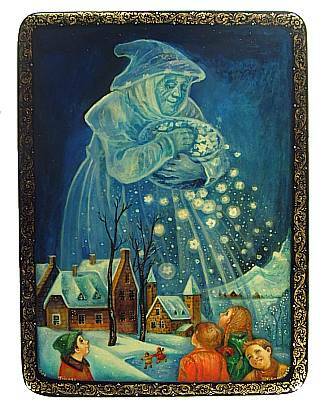 La Befana is a loving woman. She is a good woman. We turned her image into a sinister icon...oh no.....a woman on a broom. Run, hide or burn her. But, when Santa was created, they kept the cool idea about delivering gifts to good little boys and girls. Of course, the flying part is going to have to stay, too, because how else can all the children be reached in one evening, but not a broom! What then? A sleigh and reindeer? 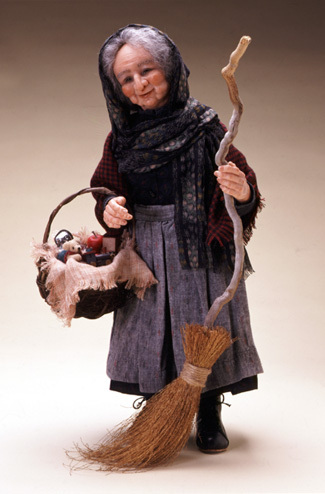 Both links on images can take you to the story of La Befana. Both sites tell the story better than I can;. I collect Santas. I have some incredibly beautiful dudes. Hand carved wood, cloth bodies and velvet robes, modern and old Saint Nicks! Sitting on the sofa yesterday, admiring my guys, it dawned on me...Where was La Befana? How could I not have at least one beautiful, glorious flying woman on her magic broom and bag full of toys for the precious children? I need her before Christmas. I need to tell her story to my granddaughters. If our culture doesn't accept a God that looks like my girls, then we sure as hell can have a Santa that looks like them! So, on Christmas Eve don't forget to hang the stockings, leave milk and cookies for Santa and cheesecake and a glass of Cianti for La Befana! This is such a wonderful myth! Will read and enjoy your links. Thank you for sharing the story of such sweet lady dear Toni!